I have seen many different variations of mounting and dismounting both disabled and able-bodied riders. I recently went through all my notes on this topic and compiled the following detailed descriptions about the ways I learned to mount and read about. I wanted to share because this was one of the hardest things for me to learn to be coordinated at doing. If you find other ways work best for you, or find corrections in this compilation, please leave a comment! This is not the final word, let’s collaborate. The following is written from a task-analysis viewpoint (the steps of dis/mounting) with tips for the instructor’s and volunteer roles, what to say, and reasons listed below each step. p.s. If this seems like an excess of information, it probably is. But that is how I roll. 70% of TR accidents happen in the mounting block, so minimize the time you spend in it! Mounting/dismounting can be difficult for the horse, rider, and staff. It should be completed as quickly as possible. Horse may become impatient with standing still, thrown off balance, and experience back strain. Try to make it the best experience possible for them. Using a mounting block, ramp, or lift is easier on a horse’s back and can help prevent soreness, especially when used several times a day. Lift with legs and abs, not your back! Have a reason for mounting one particular rider before the other. Mounting blocks/ramps/lifts should always have an offside barrier to ensure the horse is the correct distance from it. This can be another mounting block or the rider’s sidewalker, but never an actual wall, fence, or rail. In the winter beware of riders’ jackets catching on the saddle! Direct sidewalkers where to be. Use task analysis and explain to everyone what you are doing during – go slow and controlled. Use one of the methods that follows. Once mounted, it is preferred to wait until halted away from the mounting area to put their feet in the stirrups, in order to minimize time in the mounting area. If the stirrups fall below the mounting block, do not put the rider’s feet in until out of the mounting area. If they did so before, their foot could get squished between the block and the horse. Choose a safe place to halt. If rider has difficulty walking, be as close to the gate as possible. Stay away from the walls of the arena as dismounting close to them can create unsafe situations. Make sure riders are safely distanced apart. Always dismount to the ground if possible, as dismounting to a block or lift is more dangerous. Mounting to a block/lift may be required if the rider is overweight, has MS, needs reduced stress, etc. If use block and rider’s feet hang below the block, take their feet out of the stirrups first and keep the feet/legs up when you enter so they don’t get caught or squished. Have a reason for dismounting one rider before the other. Beware of low tone (wed noodle body) – keep legs together to strengthen/stabilize landing. Pivot so rider’s back is facing horse and they are in a position they can sit sideways on the saddle. Make sure you turn by moving your feet, not just twisting at the waist and injuring your back. Bring the rider out to the lift, along with a strong sidewalker. Lock the wheelchair in place. 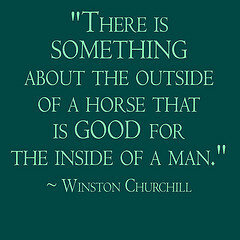 Ask the leader to bring the horse through. From ramp, position wheelchair facing the same direction as the horse, as close as possible. Rider moves to edge of chair and places right leg on seat of saddle. Instructor stands behind rider and places hands under rider’s thighs (discuss hand placement first). Count to 3 then rider pulls self onto horse as instructor lifts, and spotter guides rider’s right leg across saddle. Place the wheelchair parallel to the horse, next to the saddle. Unbuckle the rider from the wheelchair. Put the arm hooks under the rider’s armpits first. Put the leg hooks under the rider’s upper legs second. Raise the lift until the rider clears the wheelchair and is high enough to pass over the horse. Move the rider over the horse and align them above the saddle. Lower the lift until the rider is sitting in the saddle but the arms are still slightly supporting. Unhook the leg hooks. Always do this first because if the horse moves or takes off the arm hooks can still support the whole rider and keep them safe, but the leg hooks can’t. Unhook the arm hooks. Make sure the sidewalkers are supporting the rider’s upper body as needed. Move the lift out of the way. Step in for the left side sidewalker. So the rider doesn’t get caught in them. For more advanced riders, teach them how to hold on to the reins to keep control of their horse. So they don’t get caught or take the saddle with them. Beginners may need help, advanced riders should do this themselves. Check with the offside sidewalker to make sure the other foot is out. Hands on the horse’s neck, lower your upper body, look to the right. Ask they to look toward the offside sidewalker, as this helps twist their body in the right direction. Don’t hit the horse’s rear or you could hurt/surprise him! Make sure the grab at the calf, no higher, watching where you touch, avoiing the inside of the thigh..
Keep you left arm against their hip (or rib cage, or shoulder blade) and use it to push/support, move your right hand to their back or shoulder to help guide, and use your body as a chute for the rider to slide down slowly, sandwiched between you and the horse. It is recommend to keep you body at a slight angle toward the front of the horse so you can use your shoulder, side or knee as needed (not your chest). Do not place either arms under the rider’s arms. Don’t lean back but keep good body biomechanics, back straight and knees bent. Bend your knees to lower yourself with the rider as they descend, or you may lose control of the descent and your hands may slip into no-touch places. 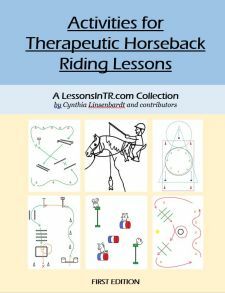 For a very large rider, push your whole body weight against them to slide them down slowly, and have the offside sidewalker support the horse to keep him from stepping over as the heavy rider tends to push the horse over as they slide down, and also hold the saddle in place. If it’s a western saddle, you can grab the sides to pull your body forward for added push against the rider. Small children you may need to just hold underneath their arms and lower them to the ground. Feet on the ground, bend your knees, and stand! If they don’t bend their knees the landing could be jarring/painful, and they could easily lose their balance and fall backward. Make sure their feet land next to the horse, not under! If you go slowly you should catch this. Keep a hand on their back/shoulder or up to spot, just in case they fall backward. Some riders may need assistance walking by holding your hand or elbow. Make sure they walk away by the horse’s head, not his rear. Right foot out of stirrup – left left foot in. Swing left leg over the horse’s rear, without hitting it. Take the left foot out of the stirrup. Don’t leave the foot in and step down, for if one loses their balance, or if the horse moves, there is only one foot to catch oneself with. For the rider that needs to dismount over the crest due to lack of flexibility, tight leg muscles, a shunt, etc. – but can walk on their own once they’re on the ground. This can be scary and slightly dangerous, so explain everything clearly and calmly, directing everyone, the whole time. Reins out of the way so the rider doesn’t get caught on them. Bring both legs up at the same time to the horse’s neck/crest. Offside sidewalker supports rider’s back and helps bring their right leg up. Your side sidewalker supports the rider’s back. You bring the rider’s left leg up. Bring right leg over the horse’s neck/crest, so both legs are side by side. Offside sidewalker supports rider’s back and helps bring their right leg over. Your side sidewalker supports the rider’s back, as the rider will need to let go and maneuver their hands to let the leg pass. You bring both legs together and take control of them. One hand on the pommel and one on the cantle, turn sideways in the saddle so they are sitting sideways facing you. Offside sidewalker supports the rider’s hips as they turn. Your side sidewalker supports the rider’s hips as well. You control the rider’s legs and bring them to the side. Take a moment to relax, find their balance and a comfortable position sitting sideways, and everyone take a deep breath. Put both hands on horse’s neck, or one on the neck and one on your shoulder. Not the pommel because it pulls on the horse’s withers. Dismount by turning onto their hip and sliding down. You support their left hip with your left hand – it helps to grab their belt loop/clothing. On the count of 3 you’ll help them twist onto their side and slide down the horse on their hip. Go slowly and slide them down, using your left hand to pull their left hip so they are facing the horse’s head and sliding down with their right side against the horse; use your right hand to make a corridor. Not twisting at all is more dangerous because they tend to want to put their hands on your shoulders and land on you. Or dismount by turning onto their belly and sliding down. (Depends on where their shunt is). Thread your right hand through the rider’s knees – under the rider’s left knee and over their right knee – and keeping your left hand on their hip/back. Rotate the rider onto their belly as you slowly lower them. Spotter holds at rider’s shoulders and helps roll to stomach. Rider descends to the ground facing the horse. When they land, stabilize them. Step in for sidewalker and have them go get the wheelchair – so the instructor remains with the student at all times. Rider’s wheelchair is placed parallel to the horse’s left side; lock the wheelchair. Feet out of the stirrups. Or rider may cross arms in front of chest, and Person 1 reaches around the rider’s sides from behind, crosses their own arms in front of the rider’s chest, and grasps the rider’s wrists. Person 2 (Instructor or Sidewalker) is in charge of rider’s legs and stands in front of rider. Offside Sidewalker controls offside leg and stands prepared. Make sure everyone is ready. On the count of 3 Person 2 and Offside Sidewalker bring legs up together above horse’s crest. Person 2 takes right leg and brings them both together, holding behind the knees. Persons 1 and 2 slide the rider off the horse. Lower the rider slowly into the wheelchair. Great information. I have also found that on a crest dismount to the ground that I have more control over the speed of hitting the ground if I “lock arms” with the rider – in other words I put my right arm around their left shoulder and they put their left arm around my right shoulder and I ease them down. My left hand is used to stabilize their right hip as they come down. Of course this depends on their ability and if they have issues with their arms/shoulders – it is not used.